A ‘substantial rain event' is heading towards the east coast in time for the weekend. Picture: Sky News Weather. SPRING may be just around the corner but winter still has some life in it yet with record low temperatures this morning and a "substantial rain event" headed for large parts of eastern Australia. A weather system is expected to travel across Australia from the west over the coming days. When it hits South Australia it will take a north east turn and barrel straight for New South Wales and Queensland. Parts of Victoria and Tasmania could also feel the effects. 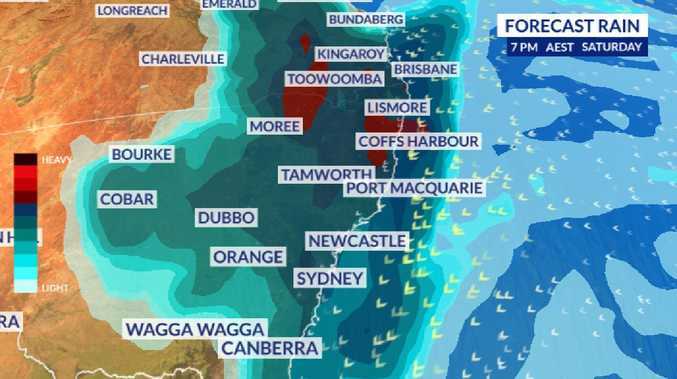 Getting on for 50mm of rain could fall in Sydney towards the end of the week and into the weekend according to the Bureau of Meteorology (BOM); 40mm in Brisbane and as much as 80mm in northern NSW and 65mm into the Gold Coast. For the entire month of August so far Sydney has only received 1.4mm of rain and Brisbane only a touch more at 3mm. The average rainfall for this time of year in Sydney is around 55mm, so if the upper end of the BOM forecast is realised that could see much of the month's moisture pour down in just days. During August, Brisbane sees just shy of 30mm of rain so this weekend's weather could well exceed that. Only 0.8mm of rain has fallen on the Gold Coast so far in August - well below the 43.4mm average. On Tuesday, 30,000 Muslims gathered in the Sydney suburb of Lakemba to pray for rain for drought affected areas and to bring relief to farmers. Sheik Yahya Safi, Imam at the Lakemba Mosque, told the crowd, "we ask everyone to donate generously to help our farmers in their crisis. 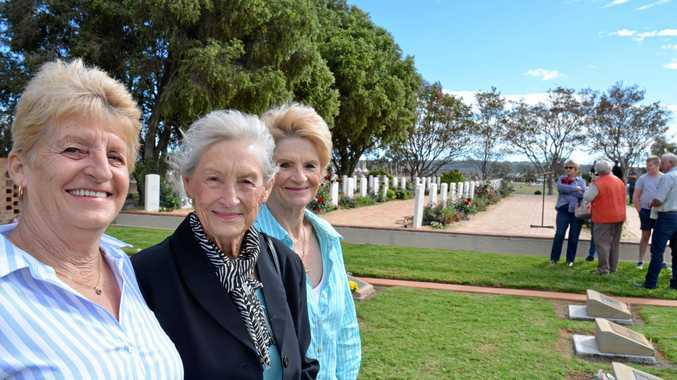 It is our duty to help Australians, especially the farmers," reported The Australian. But before the rain comes there's a chilly week to battle through. It was a cold start to Monday in Port Macquarie, with the mercury in the northern NSW town sinking to -2.2C just after dawn. That was its coldest August start of the day in 24 years. Sydney woke up to 8C and 4C in the westerns suburbs and Melbourne Airport dipped to 5.8C but it felt more like freezing. Showers and cold temperatures will linger in the south east for the next few days. As will the drier conditions from central Victoria northwards. Some rain will fall across Tasmania and southern Victoria although Melbourne should remain dry, if chilly. Just 11C is the maximum high for Monday and it's forecast to get down to 2C overnight. There will be similar temperatures in Hobart, while the Top End will be sunny with highs of 31C. It will be mostly dry and pleasant in South Australia with highs in the late teens. In Western Australia, Perth will be mostly dry but heavy rain will be seen across the southwest. 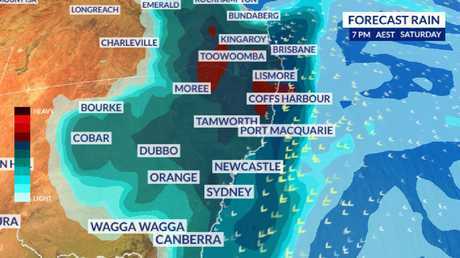 It's that system which will head across the Bight and could lead to a "big area of rain" and severe thunderstorms in the eastern states, said Sky News Weather meteorologist Rob Sharpe. "A front is progressing across southern parts of WA and then as that moves into South Australia, a low pressure system developing will move up and into inland areas. Moving with it is a fair bit of upper cold air that will lead to thunderstorms." Mr Sharpe said the rain will likely peter out before it reaches parched areas of western NSW, which will be bad news for drought stricken farmers. But then, as it reaches the coast, the rain will ramp up once again and probably hang around all weekend. "As we move into Friday, this system will run into moisture in the east so rain will develop along the coast and Tablelands." Inland areas of southern Queensland could have a low pressure system squatting right above them which would bring rain, but also hail, strong winds and severe thunderstorms. "There will big areas of rain right across eastern and central parts of NSW, southern parts of Queensland. Into Monday, that will still bring rain into Gippsland and eastern Tasmania." Over the weekend, that area of rain could stretch all the way from the Victorian border, up the entirety of the NSW coast including Sydney, Newcastle and Wollongong, into Queensland and only finally easing north of Brisbane around Rockhampton. In Sydney, the rain could begin on Friday with 25mm on Saturday and 15mm on Sunday. Brisbane will likely see 35mm over the weekend days. But it's the NSW north coast that will see the biggest drenching with 40mm falling from Coffs Harbour to Byron Bay on Saturday alone.